Finally, there are some forever stamps that I look forward to using: The Pioneers of American Industrial Design stamps. 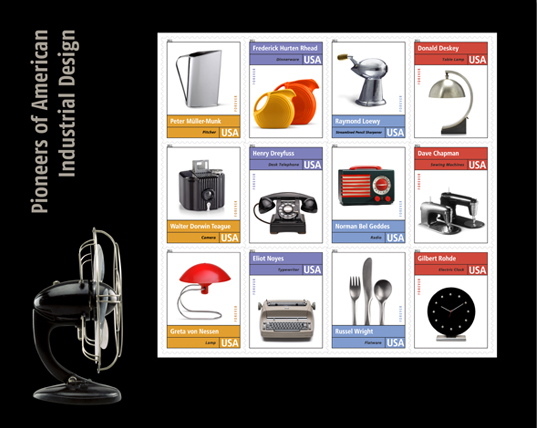 Derry Noyes, an Art Director for the USPS, selected the group of objects to appear on the collection of stamps. “Encompassing everything from furniture and electric kitchen appliances to corporate office buildings and passenger trains, the work of these designers defined the look of modern America, and in doing, revolutionized the way we live and work,” said Dean Granholm, Postal Service vice president of Delivery and Post Office Operations. Mid2Mod has more info on the individual designers being honored.